The penalties associated with DWI/DUI in Statesville, NC are severe. Driving under the influence of alcohol or another controlled substance in Statesville, North Carolina is a crime associated with severe penalties. If you are convicted of DWI/DUI, you may have to spend time in jail, go without your driving privileges for a certain period of time, and/or pay a significant fine. After being arrested for DWI/DUI, you may be worried about the possibility of conviction and how it could harm you legally, financially, and socially. When this occurs, reach out to me, W. Sloan Goforth, Attorney at Law. I will gather all necessary and relevant evidence surrounding your case and possibly mitigate the charges made against you. As your lawyer, I will provide you with tenacious, focused legal representation. Although receiving a DWI/DUI is a serious offense, it should not have the power to ruin your life. It is my goal to help you recover from this offense and establish a better future. When you are first arrested for intoxicated driving, you may picture yourself fighting your case in court. However, in many situations, these cases can be resolved outside of a court setting. I will help you determine what the best resolution option for your case is and assist you with every step of the impending process. If you were recently arrested for DWI/DUI, get in touch with my office to set up your free initial consultation. During this consultation, I will help you understand what is to come as your case is deliberated and work to understand the specifics surrounding your individual case. 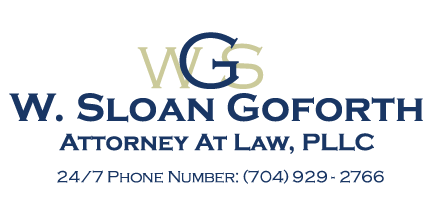 At the office of W. Sloan Goforth, Attorney at Law, we can help with legal cases regarding DWI/DUI for residents of Statesville, Troutman, Taylorsville, Mocksville, Mooresville, Hickory, Iredell County, Alexander County, and Davie County, North Carolina. As an attorney, my goal is to provide each of my clients with excellent legal representation and to help resolve personal and business issues that happen in life. Are you struggling with a legal situation? Let us help. Cities: Statesville, Troutman, Taylorsville, Mocksville, Mooresville, Hickory and surrounding areas! Counties: Iredell, Alexander & Davie, NC!